Bio: Long Beach based artist Corey "Wolf" Wolford blends street art techniques with a surrealist approach to playfully capture the imagination in his work. Born in Virginia with a natural interest in the arts and science, Wolf began studying Chemical Engineering at Virginia Commonwealth University. Upon finishing his undergraduate work, Wolf relocated to the west coast to pursue his passion in the creative arts. Wolf has since produced work for local musicians and businesses ranging from album art to elaborate chalkboard signs. His diverse artistic background has helped him to merge a variety of techniques and mediums into his own unique style. Wolf's work will be on display during the Anaheim Art Crawl Experience (Nov. 14th, 6pm - 10pm) at The Yoga Mat (1315-G North Tustin St.). This exhibition will include work from his two most recent series entitled "We Are All Spacedust" and "Thoughts On Thoughts" both of which are visual explorations into the nature of our deepest self. Bio: My name is Aric Improta, I'm 25 years old and I live in Fullerton, California. I am a full time musician playing drums in the band Night Verses and during my down time on tour is when I get most of my illustrations done. So a lot of my work usually starts and ends in different states and countries, because we travel so often. Aside from my own personal projects, I also design merch for my bands that we meet on the road. Everything is hand drawn and I almost always work in pen. I think my first curiosities with illustration stemmed from my father (who is an artist for disney), because he used to always ask for a kids menu and crayons when we would go to restaurants, and he would draw with me. However I didn't start taking it serious until I first started working at the YMCA after school program at 18, when my boss at the time gave me a sketchbook on a whim and told me she thought I needed to draw more often. And since then, I haven't been able to stop, almost all my free time outside of drumming goes to drawing. My biggest artistic influences are Aaron Horkey, Aaron Turner, Glyn Smyth, Jacob Bannon, Brandon Boyd and Storm Thorgerson. Also, I have to draw to music, I really don't enjoy the process with out it, and I often feel like the records I choose to listen to effect how my work comes out. 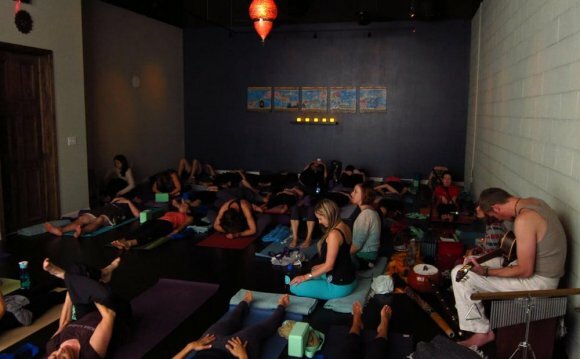 FEARLESS YOGA MALAS HAVE LANDED AT THE YOGA MAT! The always amazing Casey Merkling has been busy handcrafting these gorgeous, one of a kind malas and we are loving them! Each strand has its own story and has been infused with intention and Shakti energy. Each Mala is designed to create a collective energy vibration. She's been pouring a lot of love and excitement into these beads and we're thrilled to have them available for purchase in both of our studios. Come see them soon, their true beauty is only seen in person and make sure to follow her malas page on Facebook! Bio: Elisha Medina had no interest in or talent for drawing until the fall of 2008 when she studied abroad in Italy. There she decided to take an art class to fulfill a GE requirement-and it was in this foreign country so far from home where she was first handed a piece of charcoal. Her art instructor was not a man of many words; with a flip of his ponytail, he simply said, "Draw." And so she did, for four months, only to discover that she indeed could make pictures come to life with just a burnt stick and piece of paper. with clay-so the drawings emerge from the charcoal based on how she shapes it. In Italy, she first tried her hand at sketching inanimate objects: shoes, accessories, clothing. As she's grown in her art, she has become fascinated with the human body and its contours. She is most attracted to drawing anything with strong curves and long lines.